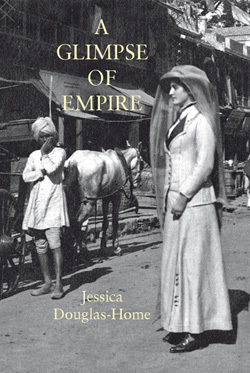 A GLIMPSE OF EMPIRE is the story of a young Anglo-Irish beauty’s visit to Delhi for the 1911 Royal Durbar, where a new King, George V, is to be proclaimed Emperor to reinforce the loyalty to the Crown of India’s ruling Princes. For a fortnight of relentless ceremony, unheard-of extravagance and imposing military spectacle, in the setting of a vast Tented City complete with its own farms, railway, telegraph and post offices, Lilah Wingfield meets many of the most remarkable colonial characters of the day, including some of the foremost Indian Princes, vying to stage the most lavish display to prove their devotion to the Raj. As the tents are dismantled, Lilah travels through India – to the dangerous Khyber Pass on the Afghan border, to Rajasthan, to the gory sites of the Mutiny and to stay with India’s only female Ruler, the Begum of Bhopal. Her diary shows her deepening awareness of the ambivalence of certain maharajahs towards British Rule even while she is being entertained royally in their lakeside palaces. Her Irish upbringing gives her an instinctive feeling for the mixture of their longing for independence and an affection for the mother country. The book is copiously illustrated by her own photographs. 144pp plus 32pp illustrations Hardback 5" x 9.5"